CRB are well known for their building works and roofing works to listed buildings and period buildings. Our staff have the traditional expertise to refurbish, repair and build bespoke buildings for discerning clients. This type of work needs knowledge, experience and patience as the traditional methods are rarely up to the speed of modern techniques. But when a client understands and embraces this approach, together we really can build brilliant buildings like this extension for Mr. & Mrs. Stevens to Leyhurst Granary. 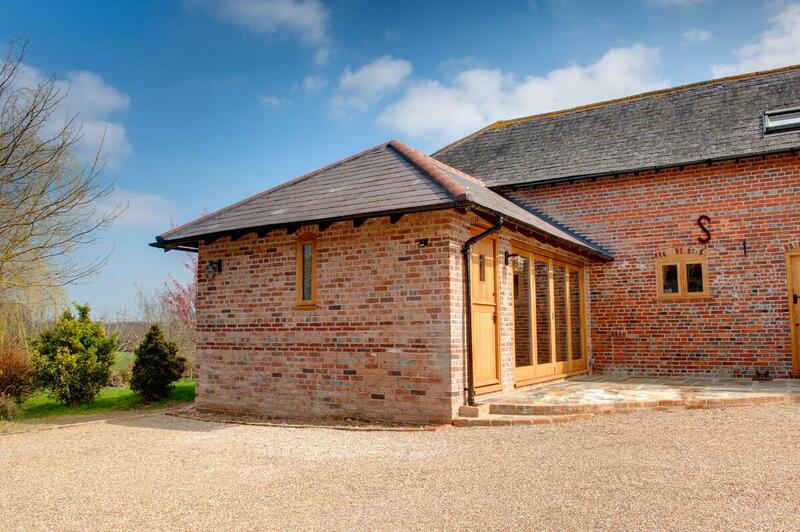 This extension to the unique Leyhurst Granary had to be both in keeping externally with the original building but still be able to meet the modern building regulations that require high levels of insulation. Our clients for this project, Mr.& Mrs. Stevens also wanted a beautiful open vaulted oak frame roof, which we designed to be both striking but in keeping with the original exposed oak elsewhere in the property. One of our critical tasks on this project was to get the brickwork just right. We selected seven local handmade bricks from an original selection of over twenty. Our bricklayer then hand selected these bricks one by one to form a pattern and colouring as close as is possible to the original building. Most people have been shocked to hear that the whole extension is built from new bricks and not reclaimed bricks, but with the right materials and the right craftsmen, it is absolutely possible to add to your listed building or building in a conservation area without detracting from it’s original beauty. You can see that the exposed oak roof adds great drama to the newly created dining area. We took the original engineers drawings which allowed for the minimum amount of timber required to support the roof, and increased the sizes and added the curved brackets and large tie beams to give the roof real presence. Externally we finished the roof in hand selected reclaimed welsh slate to match the original roof. One particular feature of this project is the oak joinery. All the doors and windows are bespoke and were manufactured by our local joinery. Even the large bi fold doors are bespoke one offs and are made from high grade air dried joinery grade oak. The architect on this project (Spitfire Architecture) has made clever use of the sun, by allowing only small windows in the rear north wall and large bi fold doors in the front south wall, the building will naturally reduce heat loss and retain better temperatures without heating. This is a feature seen in passive houses and modern eco homes and will likely become more prevalent in new housing in the coming years as we strive to achieve carbon neutral homes. Back inside the property and you can see that Mr. & Mrs. Stevens selected fantastic quality finishing products which really add to the building, like the Farrow and Ball paints, the cast iron radiators and even the Gerberit sanitaryware. Externally, we selected the finest Hargreaves Foundry cast iron gutters and cast iron downpipes to match the historic presence of the finished building. We also used a lime mortar to complete the brickwork, which not only improves the aesthetics of the brickwork but improves the lifespan of the handmade bricks.